The Supreme Court Monday dealt a blow to two states' attempts to hamstring Planned Parenthood clinics by disqualifying them from public Medicaid funds. Add Planned Parenthood as an interest to stay up to date on the latest Planned Parenthood news, video, and analysis from ABC News. The Supreme Court declined to hear an appeal in two cases concerning moves by Kansas and Louisiana to terminate Planned Parenthood health centers from their state Medicaid programs. The decisions allow lower court rulings to stand. 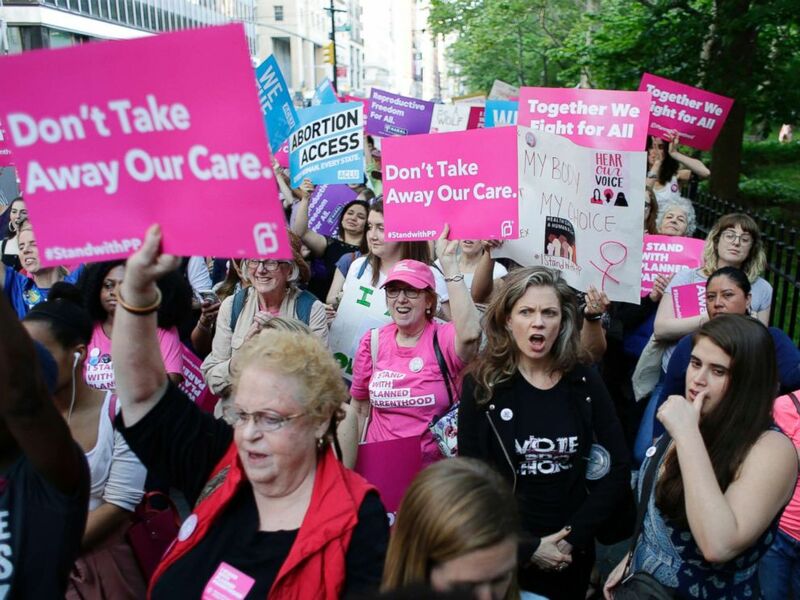 Supporters of Planned Parenthood react to speakers at a rally, May 24, 2018, in New York. While the cases do not directly relate to abortion rights, they have been seen as consequential for women and beneficiaries seeking to access care at the facilities – and for conservatives’ back-door attempts to hamper them. A majority of lower court rulings, implicitly affirmed today, have said that Medicaid patients have a right to sue to challenge a state’s decision to remove their doctor as a qualified provider. “We are pleased that lower court rulings protecting patients remain in place," said Planned Parenthood president Dr. Leana Wen in a statement. "Every person has a fundamental right to health care, no matter who they are, where they live, or how much they earn." In February, the 10th Circuit Court of Appeals concluded that states have broad – but not unlimited – authority to regulate Medicaid healthcare providers. "States may not terminate providers from their Medicaid program for any reason they see fit," the court said in its majority opinion, "especially when that reason is unrelated to the provider’s competence and the quality of the healthcare it provides." Planned Parenthood clinics provide health care services to more than 2 million Americans nationwide, according to the group's most recent annual report. They are a top provider of abortions in the U.S. but cannot use federal funds for those procedures under federal law. The Supreme Court's conservative justices, dissenting from the decision to deny a writ, said the high court should have weighed in on the question of who has a right to challenge a state's decision and on what grounds. Monday was the court's last session until Jan.4.